Recent reports from Universities Australia illustrate that over the past two decades there has been a steady increase in the number of formal agreements between Australian universities and international institutions. The peak body representing the university sector in Australia has been tracking the international linkages of Australian universities on a regular basis since 1991. In June of this year, they released two reports. The first, International Links of Australian Universities: Formal agreements between Australian universities and overseas higher education institutions, maps overall linkage activity, while the second, Offshore Programs of Australian Universities, examines the number and range of educational programmes that are wholly or partly delivered overseas by Australian institutions. So, what do the 2014 reports reveal about the international engagement activities of the Australian higher education sector today? Let’s take a closer look. In 2014, Australian universities had 8,305 formal, institution-to-institution agreements in place with their higher education counterparts overseas. This represents an increase of more than 16% since Australian universities were last surveyed in 2012 – when the number of agreements totaled 7,123 – and an increase of more than 49% since 2009, when the number of agreements was 5,561. Indeed, as illustrated in the figure below, the number of formal agreements has continued to grow since 1990, when there were around 220 agreements between Australian universities and international institutions. As for the type of international links that Australian universities have established, over 64% of current agreements include a component of academic or research collaboration. Other types of links include cooperation facilitating student exchanges (53.89% of current agreements), staff exchange (45.39%), and study abroad arrangements (23.98%). But while “study abroad” may represent the smallest percentage of current agreement types, the linkages in this area have increased the most over the past decade. The number of study abroad agreements rose from 852 in 2003 to 1,992 in 2014, an increase of 134%. Echoing that trend, links in all areas increased during the same period, although to a lesser extent. They rose by 76% for academic/research collaboration, by 38% for student exchange, and by 36% for staff exchange. Turning our focus now to the number of international engagements by region, the findings show that Australian university links continue to be concentrated in North-West Europe – where universities have established 29% of all formal agreements – and North-East Asia, which accounts for 27% of Australia’s overseas linkages. 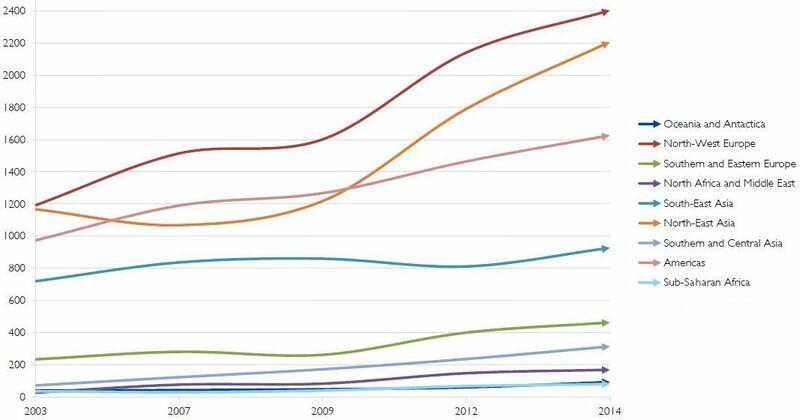 The following chart illustrates the current breakdown of institutional links by region, as well as the growth in the number of agreements in each global region since 2003. It is also worth noting that while there are currently only 367 formal agreements in place between Australian and Latin American institutions – representing 4% of all agreements in 2014 – Universities Australia has identified Latin America as a strategic priority for international engagement. Going deeper now to look at source countries, the findings from Universities Australia show that there has been little movement in the top ten countries for international agreements over the past two decades. China tops the list with 1,184 agreements, followed by the USA (955), Germany (570), and the UK (482). In one notable shift, however, India bypassed both Indonesia and Sweden for the first time to make the top ten in 2014. From 2003 until 2014, the number of agreements between Australian and Indian institutions increased from 50 to 250 – an increase of 400% over 11 years. With regard to the type of agreements that are in place with the leading partner country, China, we find that most signed agreements fall into the category of academic/research collaboration, followed by staff exchange, student exchange, and study abroad. In conjunction with its survey on the international links and formal agreements of Australian institutions, Universities Australia also surveyed its members in late 2012 and early 2014 on programmes that they deliver overseas. The bulk of offshore programmes are delivered in partnership with an international institution. There are, however, 31 offshore Australian university campuses operating at present. Finally, as illustrated in the figure below, the majority of offshore programmes are delivered in four countries: Malaysia (which accounts for 24% of all Australian offshore programmes), Singapore (20%), China (11%), and Hong Kong (11%). For additional background and more detailed findings on the international linkages of Australian universities, please consult the Universities Australia website. This entry was posted in Australia, Australia/Oceania, Higher Education, Regions, Research and tagged study abroad, universities with international students, education abroad, culture exchange, branch campus.